Err..sorry it's a bit wrinkled up. This is adult M size. 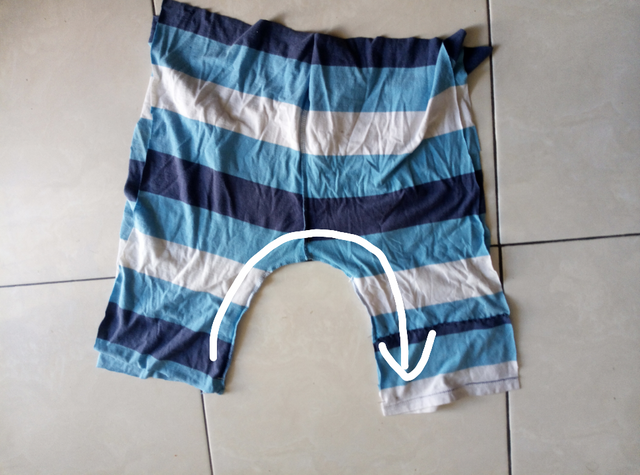 M or larger shirt would turn into a pair of pants fits elementary school kids. I know it isn't much but I guaranty you, it will be a comfy room wear😊. **The best thing about T-shirt material is... No need to do anything about hiding the edges. It will rolls up a bit but that's about it, it won't get undone. No sweat!!! And no measurements and ruler needed. Cut in half, and cut off the sleaves too. Cut straight off the collar area, and bottom edges need to be cut about the width around 6cm/2inches. Roughly is fune. Front collar is deeper, so when you cut them off, it would gets shorter than the back side. The bottom edges are needed to adjust this. And as you see, that underarm will become crotch later! Cut to fit and stitch on the bottom edges to the top so they will all become even. Don't worry if not perfectly same. Open both pieces, they will look like this. Overlap them and stitch together as shown. Rearrange the folding so the patched top comes front. You could finish this by sewing the sides, taking care of upper edge and bottom edge, then pass the elastic through the upper edge. Or continue to make a pocket... Actually no pants are good without pockets! The sleeve you have cut off earlier, stitch 2 location as shown. I was watching Baz Luhrmann's Moulin Rouge at this point. Maybe some of my tears dropped in to it😅! Attach the pocket to the side. And stich the rest of the side together. Take care of the bottom edge by folding and stitching. 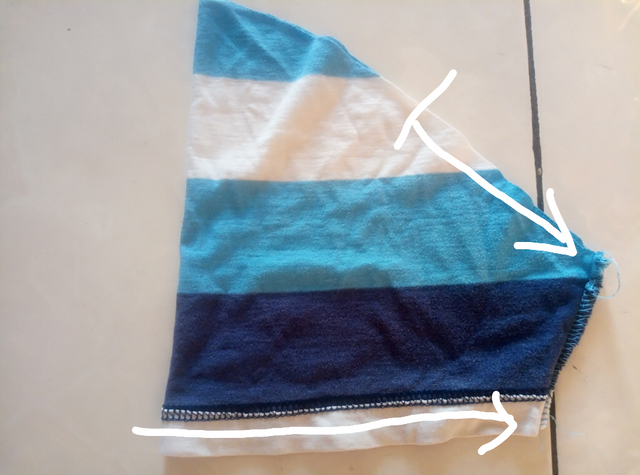 For the upper edge, fold around 3cm/1inch so elastic could go through. By the way, all looks even now, folding did the magic, yes!! I used 90% of the shirt! For a comparison, previously I used my husband's cotton collar shirt but it doesn't stretch so my son out grew quickly. I say T shirt is more flexible enough to suit longer😊. It isn't much, really, what I do. I have been trying to find out how to get things around and meet the best result as much as I could in the situation I am in. Makes me happy and proud of myself😊. Great idea @naomipangolin! I’m curious though. You sew it using machine or by hands? I am so gonna try this project. Thank you for the idea. This is a neat way to use an old t-shirt! Looks cute too. This is quite impressive @naomipangolin! I think it worked out wonderfully! They look very comfortable too! I love the added pocket! This is so inspirational for me as I embark this sewing journey! Thank you for sharing another amazing upcyle adventure with us! Perfect way to use old stuff and save some money! And the pants look cool! Thank you for the idea! That is quite amazing! You are very talented and I would imagine your son loves his comfortable new shorts!